Perhaps surprisingly, one of Venice's most-visited museums is a collection of twentieth-century art. If you have cruised down the Grand Canal, you will probably have been struck by the unfinished Palazzo Venier dei Leoni, former home of heiress Peggy Guggenheim and now home to her art collection. This grand white palazzo of Istrian stone was built in the 1750s, but the work was never completed (either the money ran out, or that neighbours objected to the palace's scale) and the building remains a one-storey oddity. Peggy Guggenheim's father died in the Titanic, and with her inheritance she travelled around Europe, mingled with artists, collected their works and married one too: Max Ernst, whose 'The Robing of the Bride' is on display here. In the process she become famous for her art collection, her lifestyle and her exaggerated sunglasses. After the Second World War she bought this Venetian palace, perhaps seeing herself as the spiritual heir of a colourful previous owner, the Marchesa Luisa Casati, a flamboyant hostess and muse to earlier artists and writers. As well as setting up the art collection which is now so popular a tourist attraction, Guggenheim brought a dose of individualistic glamour to twentieth-century Venice, where she travelled around, an instantly-recognisable figure, in her private gondola. She died in 1979, and her ashes are buried in a corner of the garden alongside her pet dogs. The Peggy Guggenheim Collection retains a very personal feel, covering major modern art movements from first half of the twentieth century. Important artists represented include Picasso, Magritte, Duchamp, Klee and Kandinsky, while there is a room dedicated to several large Jackson Pollock canvases. The rooms in the palace are now whitewashed and bare, but photographs show how they looked in Peggy's day, with the owner sitting among her eclectic furnishings. A small chamber contains jolly and brightly-coloured paintings of the Grand Canal by Guggenheim's daughter Pegeen Vail. The museum shows temporary exhibitions, and also currently features long-term loans from the Collezione Gianni Mattioli; including some masterpieces of Italian futurism. A sculpture garden features works by a range of international artists. The gallery also boasts a café and a shop (located around the corner). One of the treats of visiting the collection is the chance to enjoy the squat terrace on the Grand Canal, perhaps imagining the glamorous parties which took place here in the days of Casati and of Guggenheim. 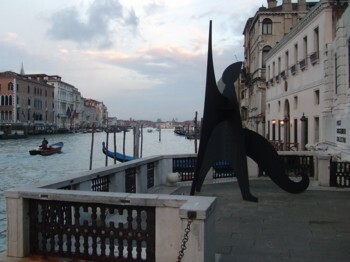 Since the latter's day,the centrepiece of the terrace has been an equestrian statue by Marino Marini (Angel of the City), which scandalises or delights sharp-eyed travellers on the Grand Canal. 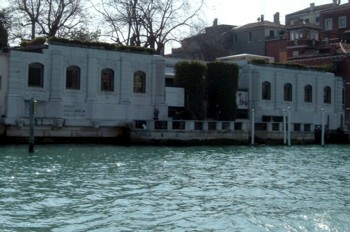 The gallery's address is Palazzo Venier dei Leoni, 704 Dorsoduro, located between the vaporetto stops Accademia and Salute. Opening hours are 10am-6pm; closed Tuesdays. Tickets cost €10, with reductions for senior citizens and students under 26.